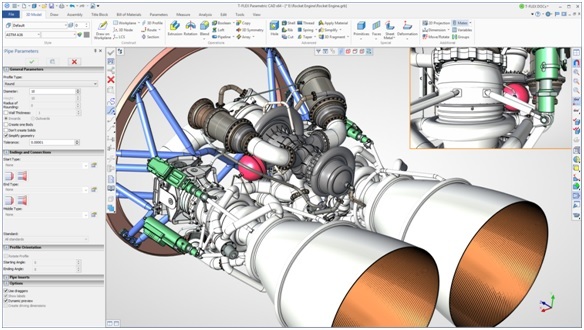 Moscow, Russia, July 17, 2018 — Top Systems, the innovative developer of advanced 3D & 2D Product Lifecycle Management software, has announced the release of version 16 of its T-FLEX CAD® system. The latest release of T-FLEX CAD introduces new possibilities for parametric sketching, effective tools for complex assembly design, new technological solutions for electrical engineering and sheet metal, virtual reality and much more. Top Systems has added to T-FLEX CAD 16 extensive customer driven enhancements and capabilities that provide increased flexibility and productivity across product engineering and manufacturing to help reduce time to market. T-FLEX CAD 16 runs on the latest version of the Parasolid kernel and uses the new high-precision geometry algorithms leading to the highest quality of result. Many part modeling enhancements were added via new options and new operations such as Bridge and new 3D construction elements including helixes. 2D detailing and drawing have been vastly improved with the redesigned set of sketching commands, new variational parametric design tools, updated commands for working with the drawing entities. T-FLEX CAD 16 continues to deliver high level of 3D CAD interoperability supporting a great variety of formats including latest versions of all major design applications and neutral files. The release of T-FLEX CAD 16 presents multiple improvements to sheet metal functions as well as new functionality. These include new operations such as Corner, Normal Cutout, Gusset, and Hem, new features in the existing commands, a semi-transparent dynamic preview, improved manipulators. T-FLEX CAD 16 introduces enhancements that help you deliver assembly designs in less time and effort. These include significant improvements in assembly performance, convenient tools for creating new parts and subassemblies in the context of an assembly, enhanced functionality for using the geometry of other assembly components while designing the part, efficient ways to access any objects throughout the entire hierarchy of a complex product. T-FLEX Electrical a new fully integrated add-on application for T-FLEX CAD provides a wide range of tools for development of electrical systems: from construction of two-dimensional circuits to the placement of 3D models of electrical components, creation of wires, cables and connections, harnessing and generation of fully integrated report documents, which include both mechanical and electrical parts. New features were added to T-FLEX Analysis, T-FLEX Dynamics, T-FLEX Nesting and T-FLEX CAM — fully integrated T-FLEX CAD add-ons that offer the wide set of specialized engineering solutions. T-FLEX VR, a new application that utilizes the latest innovative technologies allows you to see your designs in virtual reality, apply various design commands and perform advanced operations including animations and engineering analysis. New capabilities in T-FLEX CAD 16 enable mechanical design teams to take full advantage of integration with T-FLEX DOCs, professional PLM system, to help simplify data and team management tasks. For a full detailed list of T-FLEX CAD 16 new features, click here. T-FLEX CAD from Top Systems is a powerful 3D modeling and 2D drafting software that enables engineering teams to develop products more quickly, at higher quality standards, providing unique parametric mechanisms combined with production-proven Parasolid® based solid modeling. T-FLEX is written for 32-bit and 64-bit Microsoft ® Windows 7, 8 and 10 operating systems, and is distributed in various languages to customers around the world. Founded in 1992, Top Systems (Moscow, Russia) develops and markets comprehensive, easy-to-use MCAD/CAM/CAE/PLM solutions at affordable prices. For more information about the company and its products, including free trials, see www.tflex.com, www.topsystems.ru or contact a reseller. To find international resellers, visit the Resellers page.